When you think of insomnia among Service Members, you probably think of it as an affliction that results from deployment – something that plagues veterans when they return home from combat. And while it’s true that deployment and its aftermath can wreak havoc on sleep, new research is shedding light on a different phenomenon: Service Members who suffer from insomnia before they deploy are more likely to struggle with mental health issues when they return home from their mission. Returning home from deployment is a major transition; getting enough sleep can make it easier to maintain mental health. A study published in the journal Sleep surveyed soldiers at intervals prior to, during, and after their deployments to Afghanistan. Even after researchers adjusted for factors such as stress and traumatic brain injury, they found that Service Members who had suffered from insomnia in the months prior to deployment were 55% more likely to suffer from PTSD and 67% more likely to have suicidal thoughts upon returning home. How can we use this information to better care for our country’s military men and women? 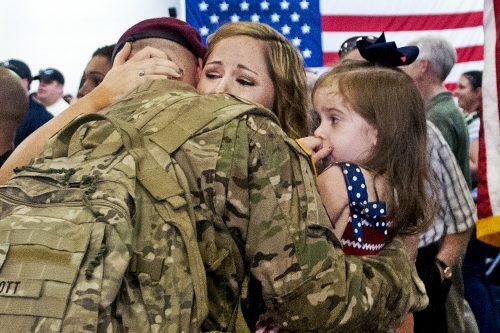 Sanford Nidich, director of the Center for Social and Emotional Health at the Maharishi University of Management in Fairfield, Iowa, commented on the results of the study, stating that “effective treatments, easy to practice, transportable, and compatible with the military culture…should be considered for military personnel who may face deployment.” We couldn’t agree more! Alpha-Stim®, a handheld medical device clinically proven to treat insomnia, may just be the ideal remedy for Service Members with insomnia. Not only is it effective, easy to use, and portable, it is already an integral part of the U.S. Navy’s pain management program, and the William Beaumont Army Medical Center’s holistic approach to care. Because Alpha-Stim is not a drug, there is no risk of addiction or lasting side effects – allowing Servicemen and women to perform their duties without interruption or impairment. Nine out of ten users experience longer, better quality sleep. On top of that, Alpha-Stim also treats anxiety, depression, and pain. Already trusted and relied upon by the U.S. Military, Alpha-Stim is also backed by over 100 independent clinical research studies. 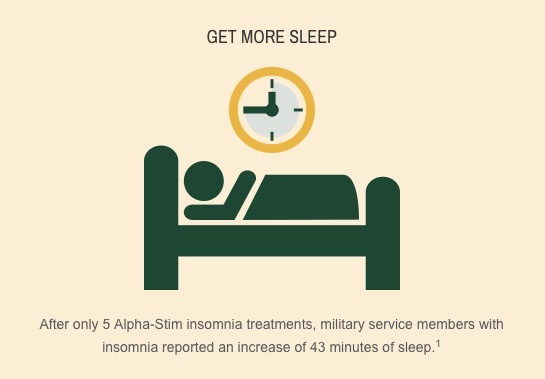 In one study, after only 5 treatments with Alpha-Stim, Service Members with insomnia reported an additional 43 minutes of sleep1, while in another study, the number of subjects rating their quality of sleep as “poor” dropped from 60% to 5%2. While deployment is inevitably difficult both physically and emotionally, being able to get consistently high-quality sleep before deployment could drastically improve Service Members’ odds of a smooth transition home. Treating pre-deployment insomnia won’t necessarily prevent mental health issues down the road, but preventative care may be a stride in the right direction for our men and women in uniform. Alpha-Stim is an FDA cleared, handheld medical device that has been proven time and again to effectively treat anxiety, insomnia, depression, and pain. Cranial electrotherapy stimulation (CES) is delivered through a patented waveform via two earclip electrodes to treat anxiety, insomnia, and depression. Microcurrent electrical therapy (MET) delivers pain relief directly to the source of discomfort via two handheld Smart Probes. Alpha-Stim is available by prescription in the United States and over-the-counter in other countries. It is available at more than half of the nation’s VAs. Service Members and Veterans should call 1-800-FOR-PAIN and ask to speak to Government Services or learn more at alpha-stim.com/military.